Ada Lovelace died, at the age of 36, on 27 November 1852. This was due to uterine cancer and bloodletting by her physicians. (not the Concrete Blond album) She left two sons and a daughter. Over one hundred years after her death, in 1953, Lovelace's notes on Babbage's Analytical Engine were republished after being forgotten. The engine has now been recognized as an early model for a computer and Lovelace's notes as a description of a computer and software. If you are familiar with DOD computer languages, you'll know her by Ada - MIL-STD-1815. In honor of Ada Lovelace Day, I want to recognize one of my early mentors, Barbara Fraire. In 1997, I found myself embarking on a new career path, away from sewing, cakes, and catering, and into the world of programing. What started as a hobby of designing web pages and a heavy BBS habit, landed me a job at a local credit union. I was quickly recognized as "computer knowledgeable" which back in 1997/1998 meant you knew how to turn one on and create and retrieve data from the web . I quickly learned that the core processor was wide open to customization and decided I wanted to figure out ways to apply my creative skills. My CEO who was inspiring in her own right, told me that I was free to explore the system and see what I could make it do. These were the early days of vi editor and Symulate, but there were still some amazing concepts available to us. The CEO sent me to San Diego for a "rep gen" class. That's where I first met Barbara. At the time, I had stereotyped programmers as pencil protector style men with gray hair and thick rimmed glasses. Even though I grew up knowing otherwise, I found it hard to believe that there were lots of great minds that broke that mold. Barbara did not have glasses, nor a pencil protector. She was young, pretty, and smart. I found myself amazed that it was possible to remain feminine and still work in this field. It was okay to be smart and creative at the same time. If you would have asked me back then where I would be today, and what I would be doing, I never would have predicted this outcome. In that first class, Barbara taught advanced rep gen. I had skipped basic, so I was a little worried if I would be able to grasp the concepts. With no formal education on the subject and only years of "playing" under my belt, I will admit I didn't go in with a positive attitude. But starting with day one, Barbara showed us all how flexible and nimble the system was, and how with a few simple lines of code you could make it do just about anything you wanted. She set us up for success. I had always pictured programming as rigid and rules based and "not for me". She taught me that it was okay to put the logic to good use, and that there was room for both creativity and smarts in this line of work. I was thrilled and excited to head back to the office with my new found skills and put them to work. Then came SEC. The fall conference had this session which caught my eye and to this day remains my all time hands down favorite, "Creative Solutions/Unique Uses". The simple concept of presenting fresh and innovative ideas convinced me I had found my calling. As Barbara and the presenters called out each and every idea and example of what was being done out in the real world synapses started firing in my head. I had more inspiration than time to complete everything that sparked in my brain. The sessions she helped present over the years, the 10+ years of mentorship, and countless amounts of inspiration that have lead to my great success as a programmer are why I want to recognize Barbara Fraire as someone who I admire in my field of credit union technology. I have a great memory of a conversation we had over a bowl of Pho at a local San Diego restaurant in the late nineties. I was down in San Diego for a class, and we had gone out for lunch that day. We were discussing some of the new enhancements to the system and how they could be used to do more for the credit unions. I remember asking her if she was happy coming to work each day working with this system and in the muck of the code. She told me that this was a line of work in which one would never be bored or at a loss for things to do and that that having purpose and being able to see results is a great reason to be happy. It's 10+ years later and I still love my job, and Pho :). Thanks Barbara! 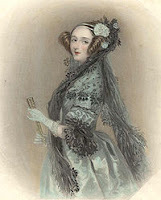 Ada Lovelace Day is an international day of blogging to draw attention to women excelling in technology. Women's contributions often go unacknowledged, their innovations seldom mentioned, their faces rarely recognized. We need to tell the world about these unsung heroines. Whatever she does, whether she is a sysadmin or a tech entrepreneur, a programmer or a designer, developing software or hardware, a tech journalist or a tech consultant, make sure to celebrate her achievements today. This blog contains another excerpt from Ada about her legacy. I loved your description of Barbara Faire. I'm just so flattered. Truly, Adele, I wish you'd told me when you posted this. I'm a little teary...but so glad I inspired you. If for no other reason that that you send me lots of great stuff every year for Creative Solutions ;). We are honored to have Barbara Fraire on our Education Team at Symitar. Her experience and knowledge about the credit union industry and the Episys system make her invaluable. And as for SymiGoddess, Adele Williams, her never-ending creativity and understanding of the Episys System and RepGen have added immeasurable contributions to SACU and Symitar. SymiGoddess has made our Creative Solutions presentations successful at our annual SEC year after year. Thank you Adele!